This is the last installment in this “Room by Room” breakdown series, of my Holiday Decor. I just have a few photos to share with you today. I’m starting with the Wreath on my front door, since that’s the first thing that you see when you enter the Foyer. I had it made at a local historical society in a town not too far from where we live. I thought they did a beautiful job on it, and the money went towards their fund for a new roof, so it went to a good cause! 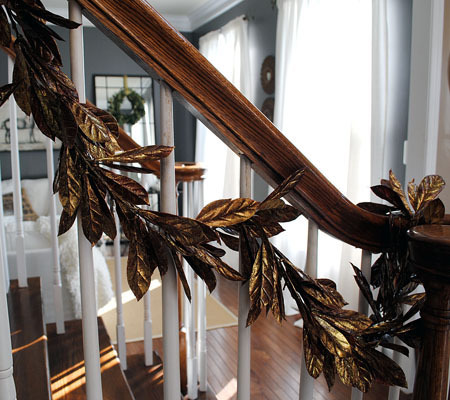 This year I dressed my staircase in this Golden Leaf Garland that I got at Michael’s. I cleared them out, and I would have liked to have gotten a few more sections for the other side of the railing. Hopefully they will carry it again next year. Here’s a close up of it. It sort of looks like Bay Leaves although it’s faux. 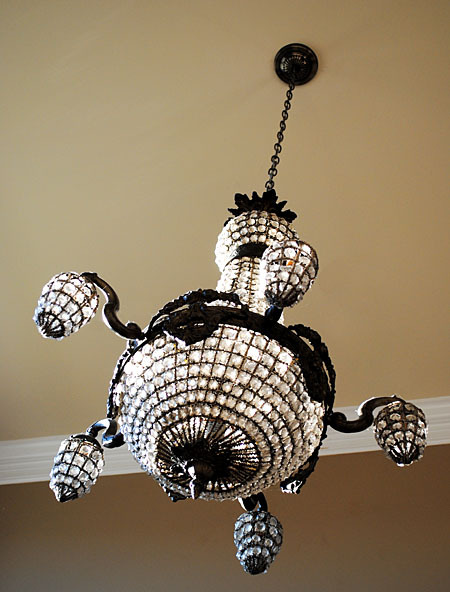 If you were to look up you would see the amazing Antique French Chandelier that I purchased from my dear friend Ted, who passed away last year. Ted gave me an incredible deal on it, and I think of him every time I see it. Here are a few odds and ends that I put on the server that sits in my foyer. 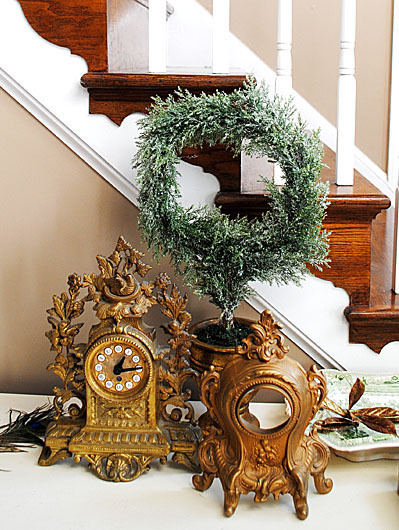 I pulled together some Gold Clocks that had been in another room and added this wreath, that has a gold pot. 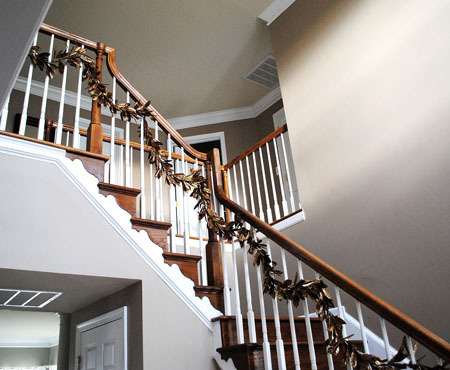 You don’t always have to use items that are meant for the Holidays in your decor, you can save money by pulling together items that fit your color scheme, from all over the house. Tag & Gift Box Templates Image Kit! 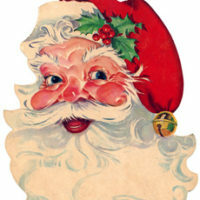 Graphics Fairy Premium Membership Free Vintage Clip Art – Santa, Santa, Santa! Lovely Vintage Bearberry Image – Red and Green Botanical! You have a truly beautiful home Karen, you can tell your heart and soul went into it. 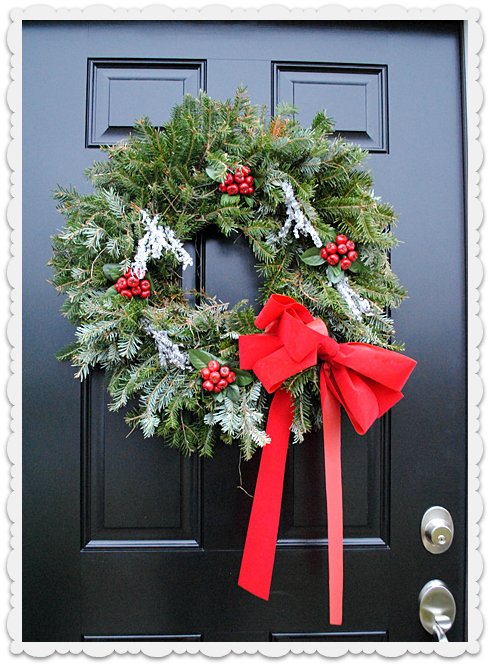 Your front door make-over is gorgeous and just in time for the Holidays to greet your guests! Thank you so much for sharing your home and creativity. Thank you so much Pendra!! Holiday Hugs to you too!! Love the way you used the gold garland. I have the same one – bought it at Michael’s about 4 years ago and usually have it laid out on the dining room table. Merry Christmas. Thanks Heather! I guess we think alike, because I bought the silver one and laid it on my dining room table! Haha. I’m glad to know that they carry this each year, since I’m hoping to get more of it next year! You have a lovely home, Karen! Your garland is so pretty and festive! 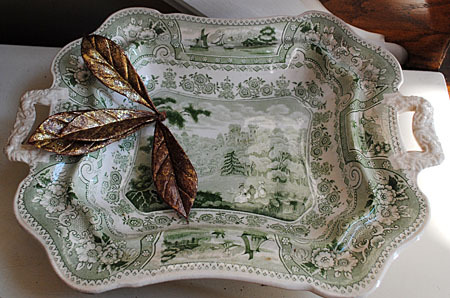 If your transferware dish goes missing- I don’t have it! It’s all so pretty! Merry Christmas! Thanks Betsy!! I’m glad you liked the dish .. I think! haha! Merry Christmas to you too!